On February 11, Pope Benedict XVI shocked the world by announcing that he would resign his office on February 28. Not since 1415 did a pope leave office by any means except death. Benedict pleaded the infirmities of his advanced age as one of the factors governing his decision to retire, and perhaps he was mindful of the spectacle of his predecessor’s public decline and death. Obviously, the Vatican hierarchy had to invent a whole series of new procedures for dealing with a former pope, not the least of which was how he was to be addressed and where he was to live out his remaining time in the world. As of March 1, however, the office of the papacy was vacant, and the speculation concerning who would succeed Benedict became more urgent. When the College of Cardinals assembled for its conclave on March 12, conventional wisdom was that the votes would be splintered among several candidates, producing a lengthy election process. But by the evening of March 13, the news broke that the conclave chose Cardinal Jorge Bergoglio of Argentina as Benedict’s successor. He announced that he would take the name, for the first time in papal history, of Francis. The new pope is 76 years old with a history of interest in the needs of the urban poor. He has established a reputation of not being interested in the luxury to which men in his position would be entitled. While proclaiming his support for the defense of church doctrine in the vein of his predecessor, he has sought to shift the emphasis of the papacy away from doctrine and toward addressing human needs. Francis is the first pope who has been a member of the Jesuits (the Society of Jesus). The Jesuits have a reputation for involvement in education and missionary work. The Society developed as part of the Counter-Reformation and became largely responsible for the strategy of infiltrating Protestant seminaries to encourage a shift away from the Reformation’s foundation in the Bible alone. Known from their inception as the shock troops of the papacy, the Jesuits subscribe to the view that the end justifies whatever means, however distasteful they may appear to be, are needed to reach that end. Historically, those means have included assassinations, deceptions, thefts, and assaults of various descriptions, including torture. The reality is that the Cardinal from Buenos Aires may have been a compromise choice. Given his age and the reported story that he was the chief alternative to Benedict at the 2005 conclave that chose a successor for John Paul II, Francis may have been viewed as a safe choice, and since he is of Italian ancestry, the Italians who dominate the Vatican may have felt a little more comfortable with the Argentine than they were at the prospect of a choice from Africa or Asia or even the United States. But it does not matter what the individual persona or character of the pope may be. It does not matter what his private views may be on any subject. The truth is that he cannot reach that position in the Roman Catholic hierarchy unless he is known to adhere to the traditions of the church. Pope Francis has spoken of his great interest in ecumenical relationships with other branches of what he would call, loosely, Christendom. As we could have expected, representatives of the usual apostate agencies made a beeline to the new pope’s side to assure him, whether in person or not, of their warm regard and ongoing support for his efforts. That which has been more appalling is the behavior of some conservative evangelicals (new evangelicals) expressing their concern for the election process and for the new occupant of the papacy. 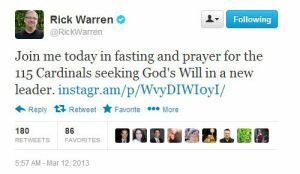 Rick Warren urged his followers on Twitter to follow his example by fasting and praying for the Lord’s guidance in the selection of the new pope. John Piper also expressed his hope that the election would produce a true reformer who would bring the church back to its apostolic foundations. Such muddled thinking reflects twisted ideas about the Scriptures and the apparent ignorance of the claims of the papacy. Pope Francis may be a different sort of man than is Benedict, but he is just the latest in a long line of those who have devoted themselves to what is an apostate religion. It is not another branch of Christendom. The Roman Catholic Church’s denial of the Gospel truth of justification by faith alone is cause for Bible believers to remain completely separated from that system. In one of the new pope’s first acts, he spent time in devotion to the Virgin Mary, a completely unbiblical concept. He is committed to the concept that righteousness is infused in Christians at baptism rather than imputed to them on the basis of Christ’s work in their behalf. The Scriptures make it plain that such apostasy will never turn back to the truth, and thus, to pray for the pope to become a reformer is a useless exercise. Therefore, the American Council of Christian Churches, at its annual convention, October 22-24, 2013, at Hardingville Bible Church, Monroeville, NJ, resolves not to be deceived by any talk of papal reform. The ACCC understands that the only hope of salvation lies in the way of faith in the Lord Jesus Christ, the Redeemer of sinners. Furthermore, we resolve to remain faithful to the legacy of those who put their lives on the line to defend the faith as the Scriptures expound it. In the new Roman pope, there is yet another spokesman for that which is false in religion, and the hopes of lost and dying souls require us to remain vigilant in the battle for the truth. “Beloved, believe not every spirit, but try the spirits whether they are of God: because many false prophets are gone out into the world” (1 John 4:1). Of course, Protestants with some knowledge of history could appreciate the irony of the timing. In that year of 1415, the Council of Constance sought to resolve two major problems. One was the increasing popularity of Bohemia’s John Huss, whom the Council accused of preaching what it called Wycliffite heresy. The Council resolved that issue by ignoring Huss’s imperial safe conduct guarantee and ordering him to be defrocked and burned at the stake. The other major problem was the existence at that time of three popes, each claiming to be the Vicar of Christ and pronouncing anathemas and excommunications upon the other two. Early in the previous century, the King of France succeeded in his efforts to secure the election of a French pope and the move of the papal headquarters to the French city of Avignon. From 1305-1378, a succession of French popes led the church in a period that even Roman Catholic historians call The Babylonian Captivity of the Church. In 1376, Gregory XI left Avignon and returned to Rome. However, upon his death in 1378 and the election of Urban VI as his successor, the French elected their own candidate, meaning that there would be two popes and launching the period known as The Great Schism. In 1409, the Council of Pisa settled on what it felt was a compromise candidate for the papacy, but the other papal occupants refused to abdicate their positions. Ultimately, the Council of Constance sought to resolve the problem by forcing two of the popes to resign and by declaring that the third, John XXIII, was never a pope at all. The Council directed that the deposed pontiff be imprisoned. In the place of all three popes, the Council decided on another candidate who became Pope Martin V.
Of course, of this rather sordid history, the world’s press and media pretended to be completely ignorant, and it is certain that not many Roman Catholic adherents knew anything about it either. Photo by Rvin88 (Own work) [CC BY 3.0 (http://creativecommons.org/licenses/by/3.0)], via Wikimedia Commons.